From motorway exit A20 CAUSSADE - D926 direction VILLEFRANCHE DE ROUERGUE - D994 direction RIGNAC- D997 direction BELCASTEL. HAVE A GOOD TRIP: if you have any difficulties to find us, you can call us. The camping is at 450 m height , in a valley of Aveyron ‘s department in France. 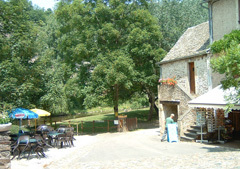 “Le Bourg” situated on the banks of the river Aveyron and in the heart of the village. Belcastel, one of the PLUS BEAUX VILLAGES DE FRANCE, it’s picture-postcard village, with its castle, (XV° century) bridge and typical houses. A magnificent and quite place. 30 pitches for caravans, tents and campers. Camping “Le Bourg”, general store , souvenirs, local and internationals products. Table tennis rackets for loan. WiFi also available on the terrace: asking the access code at the reception. Information desk: "Antenne de Belcastel - Point Informations touristiques. Fishing, river, trekking, horseback riding, restaurants and shops at 7 km.